Ian joined the NBW in October 2018 taking over the steering from founder Tom Barber. 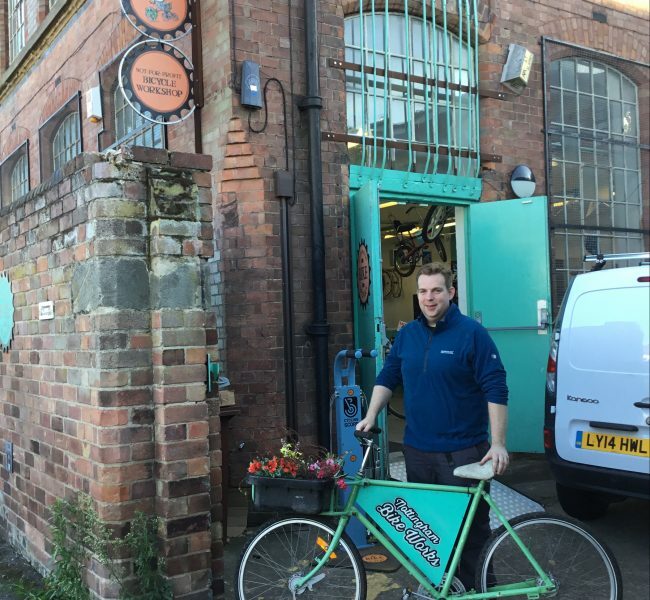 Ian has a background in sustainable travel and behaviour change having previously worked for Sustrans and most recently at Nottingham University Hospital Trust in active travel promotion roles. Ian is a keen cyclist who is equally at home on the road or in the mud. Having completed the C2C, Way of the Roses and Coast and Castles Ian, his wife and young daughter are currently looking for their next touring challenge. Dream Bike: I’ll allow myself to dream of the stereotypical midlife crisis purchase. It would have to be some kind of Italian high-end road bike, perhaps a De Rosa. I not sure my ability would justify such a purchase though! Favourite thing with a cup of tea: I love a good flapjack, needs to be a bit sticky and don’t ruin it with dried fruit or chocolate chips. Best thing about the Bikeworks: meeting the participants in our community project who together with the volunteers and staff make the Bikeworks such a fantastic environment to spend a days work in.